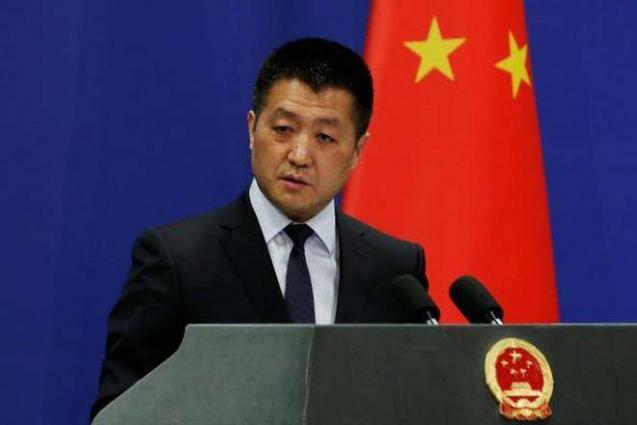 BEIJING, (UrduPoint / Pakistan Point News - APP - 17th Apr, 2019 ) :A Chinese foreign ministry's spokesperson Wednesday rejected a claim that China was given a deadline to withdraw its 'technical hold' it put to further discuss the listing issue at United Nations Security Council's 1267 Committee and said the listing issue should be resolved through cooperation and consensus. "I don't know where you get such information. The UNSC and it's subsidiary body like the 1267 Committee has clear rules of procedure and you need to seek a clarification from the sources where you get such information," Lu Kang said during his regular briefing while responding to a question that China had been given a deadline of April 23 to lift the technical hold from the 1267 Committee. The spokesperson said that his country's position was very clear. "This issue should be resolved through cooperation and we don't believe that any effort without the consensus of most members will achieve a satisfying result." Responding to a report that the US would bring a resolution in the UNSC and bypass the 1267 Committee, he said that China's stance on the listing of Masood Azhar remained unchanged. He observed that there were clear procedures and regulations regarding the UNSC and it's subsidiary bodies to resolve such an issue. "We also, stay in communication with the relevant parties. And the matter is moving towards the direction of the settlement," he added. Lu Kang made it clear that China would oppose any resolution if it would be moved in the UNSC by bypassing the 1267 Committee. "As to what you said that relevant parties are forcing a new resolution through the UNSC, we firmly oppose that," he said. "We hope that the relevant countries can respect the opinion of most members of the UNSC to act in a cooperative manner to help this issue to be properly resolved within the framework of 1267," he added. To another question about the timeline, he said as to the specifications for the discussion in the 1267 committee, there were clear procedures and regulation regarding the UNSC and its subsidiary bodies, adding, "We think, the members should follow and abide by procedures and rules." While commenting on similar question early this month, a Chinese foreign ministry's spokesperson had said that the US was setting a bad example by forcing a draft resolution on the listing issue at the UN Security Council and cautioned that it would only complicate the issue and it was also not conducive to the peace and security in South Asia. To the haste shown by the US on the listing issue and bypassing the set procedure to benefit India's ruling party in the general elections being in that country, he had replied that the US behavior was not in consistent with the rules and procedures of the UN Security Council and its customs and practices. Former Chief Minister of Indian occupied Kashmir in a statement had also accused that the incumbent Indian prime minister was playing up the alleged involvement of Masood Azhar in the Pulwama attack for the political gains in the elections.